Perennial daylilies (Hemerocallis spp.) are classified both by their type of flower and their winter growing habit. They are famously simple to maintain, but the best way to ensure a minimum of winter chores is to grow the daylily variety that is appropriate for your climate. Daylily foliage usually turns brown after the first autumn freeze. Local nurseries will usually carry daylily cultivars that will grow well your area, but you have to be alert if you order them online. The winter chores vary for dormant, semi-evergreen and evergreen varieties. Dormant daylilies will grow in U.S. Department of Agriculture plant hardiness zones 3 through 9, and semi-evergreen daylilies will grow well in USDA zones 5 through 11. Evergreen daylilies will thrive in USDA zones 8 through 11, but they'll have problems in colder climates. The foliage on dormant daylilies quickly declines at the first autumn freeze. In order to prosper, they need winter rest and typically lose their vigor in areas without freezing temperatures in the winter. As they go dormant, their bullet-shaped buds rest just below the surface, their compact structure protecting them from dehydration and winter ice. They lose all foliage above the soil until the spring growing season when they emerge from the ground in spear-like shoots. When dormant daylilies turn brown in autumn, pull off dead foliage and cut the remaining leaves to within a few inches of the ground, using pruning shears. Alternatively, leave foliage in place until spring when you can just pull it away from the plant crown. To sterilize your pruning tools, soak them for five minutes in a solution of 1 part household bleach to 3 parts of water, and then let air dry. The foliage on semi-evergreen daylilies remains green in warmer climates. In colder climates, semi-evergreen varieties decline through successive autumn freezes or go dormant and lose all their leaves in early winter. If they go dormant, they maintain themselves as short sprouts that will grow rapidly in early spring. Remove rotten or dead leaves around dormant semi-evergreen daylilies, but leave the sprouts in place. Evergreen daylilies stay green throughout the winter, although their growth slows in the winter. Freezing weather will turn their foliage to mush. Remove decayed or damaged foliage from evergreen lilies during the winter. 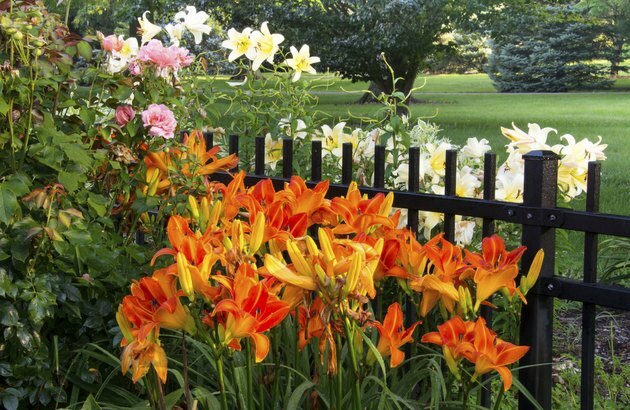 Mulching daylilies with a 2-inch layer of leaf mulch, wood chips or straw** will help control weeds and moderate the effects of winter freezing and thawing. Replace the mulch as it rots each year. Winter cold may cause distorted foliage on dormant varieties and dormant semi-evergreen varieties as they emerge in spring, a phenomenon sometimes called "spring sickness." With warming weather, this damaged foliage will recover and grow normally.